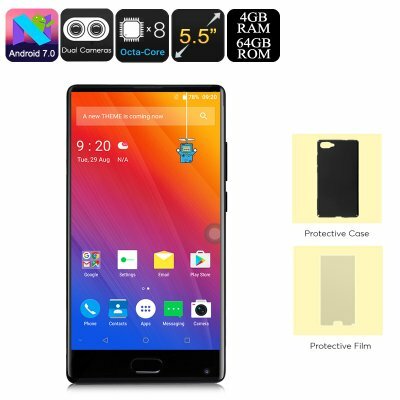 Successfully Added HK Warehouse Doogee Mix Android Phone - Android 7.0, Octa-Core CPU, 4GB RAM, 5.5-Inch Small Bezel Display, Dual-IMEI, 4G (Black) to your Shopping Cart. With its edge-to-edge 5.5-Inch display, the Doogee Mix Android phone treats you to a stunning visual experience. This Android smartphone truly lets you enjoy all your media and mobile entertainment like never before. By treating you to crisp 720p HD resolutions, it lets you enjoy vivid colors and high details. Whether you watch a movie or play a game – this Android phone along with its massive display is sure to impress. In order to let you take your media to the absolute most, your phone comes packed with a 3380mAh battery. This cell lets you enjoy your favorite films and games for up to 8 hours straight. Underneath its bezel-less display, the Doogee Mix Android phone packs a powerful Octa-Core processor. This CPU has been clocked at 1.69GHz and, together with the phone’s 4GB of RAM, delivers a smooth performance. With all this hardware at hand, you’ll be able to enjoy the latest and most demanding software features without ever dropping a frame. To make sure that you’ll always have enough storage for all your latest downloads; this Android phone comes with 64GB internal storage and a whopping 128GB external memory support. Android 7.0 treats you to a lag-free user experience while you’re taking advantage of all your phone’s features. It furthermore comes with Dual-IMEI numbers and 4G. This brings along great connectivity for you to enjoy no matter where you’re at. From now on, you’ll always stay connected to friends and family even while traveling abroad. While you’re off on your next trip, this phone does not only keep you in touch with your loved ones but also lets you snap stunning pictures. Thanks to its 16mp dual-rear camera that features an F2.0 Samsung ISOCELL Sensor, you’ll be able to snap breathtaking photographs and 4K video at any given moment. The Doogee Mix Android Phone comes with a 12 months warranty, brought to you by the leader in electronic devices as well as wholesale Android Smartphones..